Happy 80th Birthday to Mel Warshaw, Mike Hugo is turning 65, and Chris Walsh’s birthday was yesterday. Please send him a card. Posted in Minutes on May 21, 2017 by Gwendolyn Holbrow. Framingham is in the process of electing its first city government, including a mayor, eleven city councilors, and nine school committee members. Primaries will be held if needed on September 28, 2017, and the general election will take place on November 7. 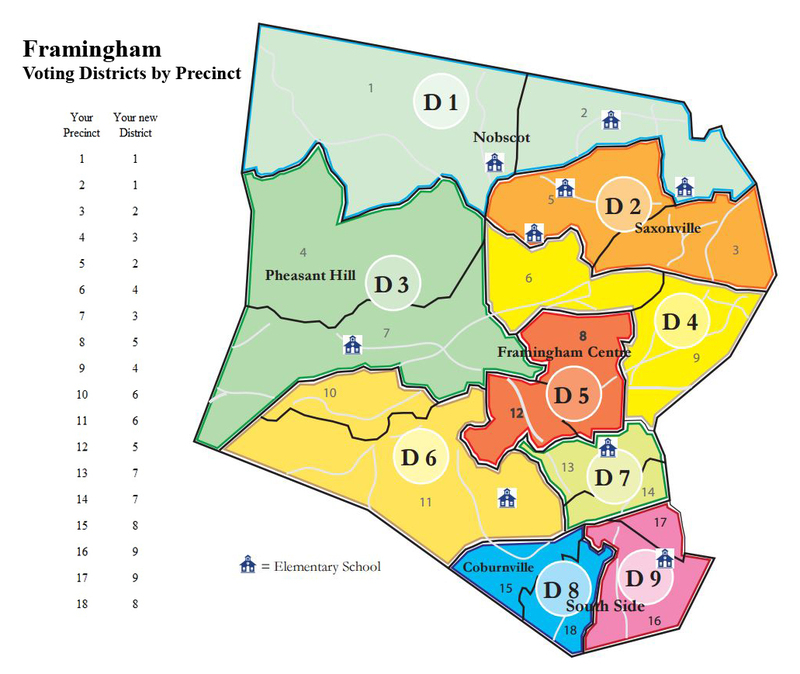 Check your precinct in this map to find your district. If you are eligible to vote and have not yet registered, you can register online here. And it’s not too late to run: nomination papers became available on May 1, 2017 from the Framingham Town Clerk, and must be returned with signatures by July 1, 2017. The newly elected officials will be sworn in on January 1, 2018. For more information, please read the Elections section on page 44 of the Framingham Home Rule Charter or consult the Town Clerk. Posted in Archives on May 1, 2017 by Gwendolyn Holbrow. as add-on delegates to the 2017 state convention. Posted in Archives on April 28, 2017 by Gwendolyn Holbrow. Posted in Minutes on April 23, 2017 by Gwendolyn Holbrow. The Official Town of Framingham Election Results for the April 4th Election (Excluding Write-Ins) are available here. According to the new Framingham Home Rule Charter, Framingham will become a city on January 1, 2018. Posted in Election results on April 10, 2017 by Gwendolyn Holbrow.